Real World IFR is delivered in a series of seven IFR flights — recorded start-to-finish and with increasing complexity as you move through the program. There is a briefing before each flight, so you’ll know what to expect. Then you follow IFR veteran Keith Smith (bio below) on flights in various airspace and weather conditions, some in his high-performanceLancair 360 and others in an FAA certified flight simulator with live ATC interaction. Some flights are in Keith’s Lancair 360, some in the sim so we cover it all. Looking over Keith’s shoulder as he works his way through challenging instrument flights makes for some interesting viewing. You will see exactly what he sees and hear exactly what he hears. Observing an expert at work will give you insights into IFR procedures, ATC interactions and critical decision making you can’t get any other way. You’ll find yourself glued to the screen and focused on the scenarios as they unfold, trying to anticipate what will happen next. Keith makes mistakes and not every flight goes exactly as intended – because it’s real, unscripted flying! That’s why this program is so unique. You may end up watching these flights over and over to gain confidence with IFR in the real world, from its simplest to its highest demand. The briefings and ground school lessons provide a thorough IFR refresher. The Real World IFR program was developed by the PilotWorkshops team and led by Keith Smith. Keith is a highly accomplished instrument pilot and founder and developer of PilotEdge, the award-winning network that provides real (human) ATC interactions for pilots flying and training on flight simulators. In addition to creating the PilotEdge network, Keith has personally logged more than 9000 hours on his network providing virtual ATC services to pilots across thousands of simulated instrument flights. Unlike a typical FAA controller who only deals with a single phase of flight, Keith routinely provided service from the clearance delivery phase all the way through the enroute level. He has controlled the full, door-to-door IFR experience in a wide variety of airports, airspace and situations. This experience gives Keith a truly unique perspective! He has seen first-hand the mistakes instrument pilots make, where they struggle, and what their key challenges are. He developed this program to address these challenges head-on, so pilots could get over the fear of flying in the IFR system and develop a higher level of comfort. Keith flys his Lancair 360 in four of the Real World IFR flight videos. He has logged over 600 hours in this airplane and routinely flies it in a wide range of weather conditions at airports ranging from 1800 ft non-toweredstrips to JFK, Atlanta Hartsfield, DFW and everything in between. Keith is not an instructor, instead he gives you the perspective of a highly accomplished IFR pilot flying in the system. His focus is on managing these challenging instrument flights from a PIC perspective (single-pilot)in the left seat rather than providing flight instruction from the right seat. This further enhances the “Real-World” feel of these videos. Brief and fly SIDs; they’re not just for jets! This icebreaker eases you into the system; no tricks here. The briefing items include a route review, with the differences between cleared routes and reality, how to predict an approach clearance, and tips for unfamiliar airports. The realities encountered in flight include departure delays, ATC confusion, altitude deviations, hunting for the best altitude, and handling a high-speed approach in gusty conditions. Also includes a 15 minute iPad briefing where Keith shows you step-by-step how he prepares for IFR flights using ForeFlight. With its more complex enroute portion, this flight’s briefing includes several ways to navigate, creative use of GPS for unpublished routes, issues that could bite you if plans change enroute, and approaches you might get cleared for and can’t completely fly. The flight involves an emergency, creative use of the iPad, helpful GPS tricks, and how to work with ATC. The briefing covers departures from non-towered airports, obstacle departure procedures, weather with icing issues, understanding what ATC does and doesn’t provide when you get on radar, ODP, and transitioning to an approach when a hold-in-lieu-of-procedure-turn lies in your path. The scenario demonstrates the traps of an ODP, autopilot dependence, distraction, diversions, and planning (and re-planning)on the fly. It also shares how not to fly an approach when you’re in a hurry—and how to get it right when you try a second time. This flight starts at Los Angeles International, so the briefing hanpes the complexity: the latest ATC phraseology for SIDs and clearances, planning for a big-airport Standard Instrument Departure that must be flown quickly and with precision, and the best use of automation. The situations encountered span from task saturation, autopilot issues, surprise issues from ATC and a surprise circle-to-land. This is the first leg of a three-leg triangle including a small airpark and one of the United States busiest airports. The complete briefing for all three legs covers weather, alternate planning—and tips for making that simpler—planning arrivals and departures, and where to park a private airplane at JFK. (Hint: it’s a really long taxi.) The serious IFR conditions Keith encountered has him dealing with repeated delays, plowing through some of the densest air traffic in the country and flying an approach to minimums in IMC in his Lancair. Issues encountered on leg two include lost clearances, delays, tricks for working with ATC and ForeFlight to fix these issues, 190-knot groundspeeds, missed clearances, mixing it up with airliners, and an insider’s view of JFK operations. This final leg is no pushover. Encountered on the way are: poor departure planning and a botched departure in New York airspace (it all works out), missed ATC reports, hearing the pros mess it up as well, use of ADS-B weather in flight, issues joining approaches with kickin’ tailwinds, changing plans in flight—twice—and how a contact approach can be your friend. Keith has to work hard to get his IFR departure release at a non-towered airport in the NYC area. In order to get the maximum benefit from the Real World IFR videos, many pilots will benefit from a refresher to fill gaps in their IFR knowledge or experience. With this in mind, we developed this highly focused ground school that teaches key IFR concepts and situations that arise in the flight videos. These lessons are focused and cover the most important rules, skills, knowledge and procedures that Instrument pilots need to know. Ground school should be fun, so we packed these lessons with videos and animations to make them more enjoyable and effective. This is not a “pass the test” ground school to help you prepare for the written exam. Instead, the IFR Refresher Ground School is a useful online video library that pilots can use as needed to brush up on their IFR knowledge or help knock off the rust. Covers the many ways to depart an airport on an IFR flight. Required climb gradients for diverse departures were changed late in 2014. VFR departures also receive a thorough treatment, offering a way to avoid lengthy IFR delays from the departure airport. One of the least understood procedures in the world of IFR, this lesson explains what ODPs are, why they are needed, how to find them and when you can or cannot fly an ODP. SIDs are departure tracks which allow the IFR system to scale in busy terminal areas. This video covers pilot nav, vectored and hybrid SIDs in RNAV and non-RNAV form. We also discuss the nuances of the “Climb via SID” instruction. The enroute phase is where most IFR pilots will spend their time. This lesson covers the basic rules and regulations of enroute flight and covers more advanced techniques such as block altitudes for weather avoidance, and VFR-on-topcompared to VFR-over-the-top. We review techniques you can use prior to reverting to lost comms. We also walk through an end-to-end scenario from wheels up to wheels down in IMC including route and altitude selection. Enroute charts contain a wealth of information for flight planning. They also contain important information that you might need in real-time during your IFR flight, even if you fly with an IFR-approved GPS. This provides a detailed walkthrough of how to interpret the symbols and figures on a low enroute chart. Don’t skip this one! You probably already know how to fly direct, teardrop and parallel hold entries. What you may not know is what causes so many IFR pilots to fly the RIGHT entry into the WRONG hold. We provide several sample scenarios with holding instructions you might receive and discuss what the resulting holds would look like. This is great refresher on the fundamentals of instrument approaches, including a breakdown of the roles of each of the 5 approach segments, the two types of course reversals, approach categories and circling approaches. We also break down the elements of an approach clearance so you won’t be surprised when you shoot your next approach in the system. With all the fundamentals covered in the previous module, we’ll walk through the specific procedural differences between precision and non-precision approaches. Your instrument training probably consisted of a back-to-back series of instrument approaches to minimums with lots of missed approaches. Well, in the real world, visual approaches are actually very common. This lesson walks through generic visuals and charted visuals. We also review the underutilized contact approach which provides stunning utility but can get you into a world of hurt. Every IFR flight starts with the clearance. This module reviews the fundamental elements of an IFR clearance and covers the best practices for copying them down when the controller also moonlights as a record-setting auctioneer. A great review if you have been shooting approaches under VFR to stay current but haven’t filed and flown in the system in a while. Let’s walk through an end to end IFR flight, focusing exclusively on what you might say as the pilot and what you might expect to hear from ATC. If you haven’t flown IFR in a while, or your initial calls with approach are, “this is Cessna 123AB, checkin’ in with ya, IFR out of Caldwell, heading 180, climbing up to 2000,” then you and this module are going to get along very well. At the surface, this isn’t the most exciting topic, and by the end of it you’re opinion probably won’t have changed. However, when the weather is marginal, what may have seemed like a confusing and arbitrary collection of rules suddenly starts making a lot more sense. This covers what you need to know to make legal and safe decisions during your IFR flight planning. Keith explains a simple technique you can use to avoid departure delays at non-towered airports. Q. 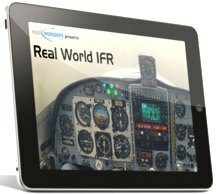 How do I access the Real World IFR videos? A. Your videos are available online via a secure, password protected website. You can watch the videos on any device – Windows PC, Mac, iPad, iPhone or Android. The website has a simple menu structure so you can easily find the segment you want to watch and start it with the click of a button. A. Yes, with the optional USB drive you can move the video files from the USB drive to your iPad using your computer and iTunes. We provide step-by-step directions. Of course, you can view the videos online on your iPad with an internet connection, so downloading them is optional. A. Yes – with your login info, you can access the site from any device, for personal use, as often as you want. You may add an optional USB flash drive to your order which contains all the video files in MP4 format. These videos can be easily viewed on any computer or laptop, and can be imported onto an iPad so you can view them even if you are not online. A convenient and portable way to access the videos. You can earn 6 WINGS credits for completing Real World IFR: 2 basic, 2 advanced and 2 master. A simple online form for requesting credit is included on the website.